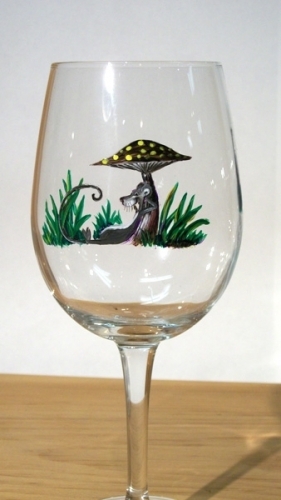 Hand Painted Wine glasses by Joe Baltich in Ely, MN right here at Northwind Lodge. These glasses feature a universally popular shape that can be used for either white or red wines. Boasting a 14 ounce capacity, this glass allows plenty of space for wine to breathe. Each glass is hand painted with strict attention to the finest details. Colors are very bright and are oven baked to ensure durability. Poses will all be varied when ordering in multiples of two or more.